International Conference for Advances in Business Management was hosted by SIBM Pune on 14th and 15th December 2018. The event was also graced by Prof. Dr. S. B. Mujumdar, Chancellor, Symbiosis International (Deemed) University. Mr. Jijith NK – Director, DXN Holding BHD Malaysia was the Chief Guest for ICABM and released the Book of Abstracts during the inauguration function. Mr. Shri Suresh Prabhakar Prabhu – Minister of Commerce and Industry and Civil Aviation, GoI, graced the function as the Guest of Honor. We had Prof. Pawan Budhwar from Aston University, Prof. Meenakshi Rishi from Seattle University, Prof. Jacol Dahl Rendtorff from Roskilde University, Prof Dr. Koen Vandenbempt from University of Antwerp and Prof. Niranjan Chipalkatti from Seattle University as our Keynote Speakers for the two day event. Encompassing Research paper presentations, panel discussions, keynote addresses on the current business scenario and prospects for the future, ICABM concluded as a phenomenal success. 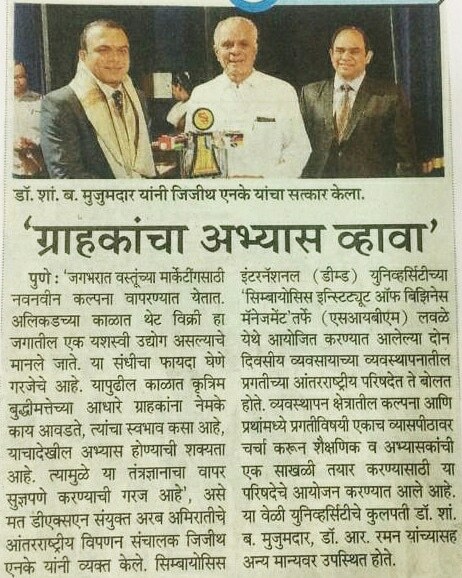 The story has been recently featured in Maharashtra Times. International Conference for Advances in Business Management was hosted by SIBM Pune on 14th and 15th December 2018. 0 out of 5 based on 0 ratings. 0 user reviews.